Actor Jake Gyllenhaal says he wants to be taken “a little less seriously” as an actor, and would love the Prince of Persia to become a franchise. England coach Andy Flower is confident his side have the talent to overcome Pakistan in their ICC World Twenty20 Super Eight showdown on Thursday. Despite recent off-field problems, reigning champions Pakistan remain a force under captain Shahid Afridi. But after securing progress from Group D via a no result against Ireland on Tuesday, England are ready to kick on. "Pakistan are a very dangerous side," admitted Flower. "But I think we are pretty dangerous as well." The 42-year-old added: "Pakistan would be a scalp. They have lots of talent, and a lot of variety in their attack. "But our guys have shown attacking intent, quite a lot of power and the nous to time the innings properly. "I thought the guys showed a lot of understanding of the ebbs and flows of the game against West Indies in Monday’s Group D defeat in Guyana." Having succumbed to an the eight-wicket Duckworth Lewis defeat to the West Indies, England narrowly secured their place in the Super Eights via a superior run-rate after Tuesday’s game with Ireland in Guyana was rained off, ending in a no result. "It’s been a funny couple of days, so disjointed," said Flower. "We were nine balls from another Duckworth-Lewis result, so it’s nice to get through." Having reached this far, Flower is confident that the make-up of the side is the right one to ensure further progress, citing the inclusion of Michael Yardy as an example. "I think bringing in the left-arm spinning all-rounder helps balance our side – and we’ve got a good variety of type of player," stated Flower. "That does ask a lot of questions of the opposition attacks. We’re very excited about the potential – but we’ll see how we go." Flower also praised batsman Eoin Morgan, who followed up a score of 55 against the West Indies with a knock of 45 against his native Ireland. "He’s got a good brain on him and he’s very talented," admitted Flower. "Anyone who can hit the ball as cleanly as he does, and hit some of the shots he does, obviously has a great combination. Should make for interesting viewing! "He has freedom to express himself, and we don’t want to rein that in. We want him to be free to make his own decisions. "We’re very thankful to have him." In contrast, Pakistan have had anything but a settled side of late. In March, the Pakistan Cricket Board banned Mohammad Yousuf and Younus Khan indefinitely from representing their country, while Rana Naved-ul-Hasan and Shoaib Malik were each given one-year bans and big fines, as a result of "infighting which… brought down the whole team". Current Twenty20 captain Shahid Afridi, Kamran Akmal and Umar Akmal were also given heavy fines and warned that their conduct will be strictly monitored during a six-month probationary period. However, they put such problems behind them in their opening game to seal a 21-run victory over Bangladesh in St Lucia on Saturday , and despite a 34-run loss to Australia on Sunday they remain in the hunt to defend their crown. England and Pakistan have already faced each other twice in Twenty20 this year – drawing a two-match series in the United Arab Emirates almost three months ago. A stand of 112 between Morgan and Kevin Pietersen saw England take the first match by seven wickets, before a stunning 46 from 18 balls – including five sixes – from Abdul Razzaq saw Pakistan to a four wicket win. 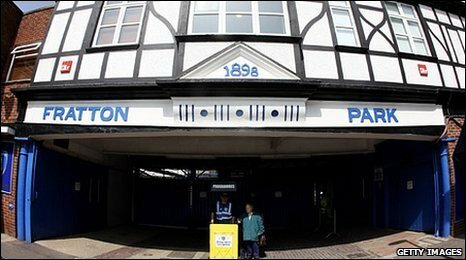 Portsmouth’s administrators have revealed the relegated Premier League club’s debts now stand at £138m. In February, Pompey became the first Premier League club to enter administration with debts of £60m-£70m. And in April it was revealed the FA Cup finalists, who have had four different owners this season, were £120m in debt. The news comes on the day creditors meet to approve the drafting of a debt-repayment plan that will enable the club to emerge from administration. The club is offering to pay at least 20 pence in the pound over five years, and has said that small creditors and charities will be paid in full. If approved, that plan, a Company Voluntary Arrangement (CVA), will be drawn up by the club’s joint administrators from UHY Hacker Young and distributed within five business days of Thursday’s meeting. Another meeting will then be arranged within 14-28 days to approve the CVA. This will require the backing of 75% of the club’s unsecured creditors (based on amounts owed), whereas a straight majority will be enough on Thursday. Portsmouth’s so-called "football creditors" must be repaid in full under football’s rules. This group includes clubs still owed over £17m in transfer fees by Portsmouth, and current and former players who are owed almost £5m in bonuses, wages and image rights payments. Pompey’s current owner Balram Chainrai will also get his outstanding £14.2m loan repaid in full but his three predecessors – Sacha Gaydamak, Sulaiman Al-Fahim and Ali Al-Faraj – will have to accept the same reduced rations on offer to the non-football, unsecured creditors. Prominent among this group is Her Majesty’s Revenue & Customs (HMRC), which is owed £17.1m in taxes and National Insurance contributions. The UK Met Office has released a vivid series of images that show the Eyjafjallajokull volcano intensifying. In the satellite pictures, which use infrared wavelengths, the ash plume appears as bright orange colours spreading out from the volcano. The plume gradually increased in size over a period of approximately six hours on Thursday morning. This animation is made up of a series of 13 images captured every 30 minutes from 0600 BST. The Met Office confirmed that activity from the Eyjafjallajokull volcano had been increasing since Wednesday night, taking the ash plume to a height over 30,000 ft. 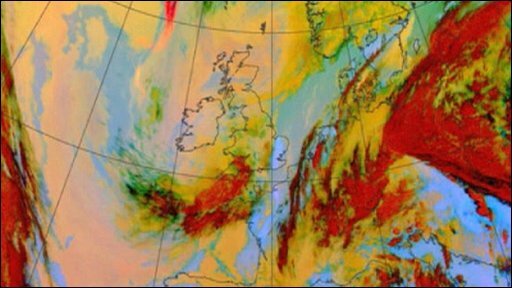 But the UK’s air traffic control authority, Nats, said that the high density area of the volcanic ash cloud was now lying "off the west of Ireland" and that, as a result there were currently no restrictions within UK airspace. A Met Office spokesperson also said that the winds forecast over the next few days were likely "to keep the plume out to the west". Dr Jim Haywood, an aerosol research scientist from the Met Office explained that it had previously not been possible to capture such clear pictures. "This is the best set of images of the plume that I’ve seen," said Dr Haywood, who has been monitoring the ash plume since the volcanic eruption entered its explosive phase on 14 April, and began to release the plume of ash that has caused so many problems in the UK. "The reason it’s so clear is that there’s no cloud around at the moment," he explained. "If there is any cloud above or below the plume, it’s much more difficult to see." Because it was exploding through a glacier, the Eyjafjallajokull eruption had been creating its own cirrus cloud. "It appears now there’s a clean clear signal because all of the ice above the volcano has melted," said Dr Haywood. In the rest of the image, low clouds appear predominantly yellow, while high ice clouds appear dark red, brown or black. 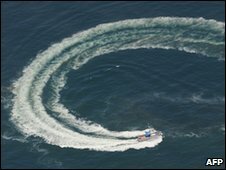 The full environmental impact of the oil spill deep under water in the Gulf of Mexico has yet to emerge. But there has already been a sizeable political fallout. Two Republican governors, in California and Florida, have withdrawn their support for the idea of expanded offshore drilling and a number of Democrats in Congress have warned that they can no longer support energy reform legislation if it includes such provisions. President Barack Obama recently announced that he was willing to lift a decades-long moratorium on drilling in new areas of the Gulf of Mexico and the Atlantic coastline. At the time, he said any new exploration would "balance the need to harness domestic energy resources and the need to protect America’s natural resources". The president clearly hoped to win support for his wider energy policies among Republicans who are sceptical about his efforts to combat climate change and believe that America should make the most of its own energy resources. Win over some of the "drill, baby, drill" crowd, the thinking went, and you can persuade them to contemplate legislation that tackles climate change. But along came a spill, and look what happened. 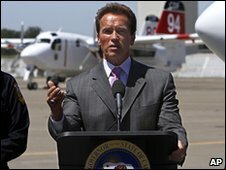 "You turn on television and you see this enormous disaster," said California Governor Arnold Schwarzenegger, "and you say to yourself, why would we want to take that risk?" The governor promptly announced that he was no longer in favour of expanded drilling off the California coast, despite that fact that the state’s empty coffers could badly use some extra cash. Florida’s Governor Charlie Crist also withdrew his support. But if the thought of renewed offshore drilling seems rather less appetising now, where does that leave the sort of wider energy legislation the president wants to see passed? Another Floridian, Democratic Senator Bill Nelson, bluntly suggested that the sop to conservatives was no longer an option. "If offshore drilling off the continental coast of the United States is part of it, this legislation’s not going anywhere," he told reporters on Tuesday. Of course, not everyone agrees. Mary Landrieu, Democratic senator for Louisiana, told the Senate last week the US could not afford to bury its head in the sand over its energy needs and "must continue to drill". Speaking to a New Orleans TV station on Sunday, she said: "Our country needs this oil, there is no question about that. "We have to produce this oil at home unless we want to be completely reliant. We’ve got to investigate, fine, clean up and do the research necessary to make sure this will never happen again. We have to continue to go forward." And in a statement on Monday, Republican House leader John Boehner insisted that the US needed a "real, comprehensive energy plan" – one that would include drilling. Democratic leaders are still hopeful the bill will go through. "I don’t think this is something that will stop" the bill, Democratic House Speaker Nancy Pelosi told reporters on Tuesday. But the fate of the bill, and its offshore drilling provisions, remain open questions. Among the ranks of environmental activists, meanwhile, there is a feeling that this is a decisive opportunity. "There have been two game-changing developments," says Damon Moglen, global warming campaign director for the environmental group Greenpeace. "This terrible accident in the coal mine in West Virginia [which killed 29 workers] has really called into question the notion of more funding for coal," he says. "At the same time, this horrific oil spill… has really changed the dynamics." Greenpeace was already highly critical of the energy reform bill working its way, very slowly, through the Senate. The bill would reduce carbon emissions, but, says Damon Moglen, offers far too many concessions to oil, coal and nuclear energy. "This is a terrible, terrible tragedy and it is a historic, teachable moment for this president," he says. "This is an opportunity where we can say… the cost of using petroleum and other fossil fuels should be deadly clear." And if lifting the moratorium on new offshore drilling is no longer on the table, he says, then this will be more than made up for by renewed pressure for better legislation. "In the political calculations of a month ago, it looked like success on the climate change legislation might lie in wooing a few Republicans over and taking Democrats for granted. That dynamic has changed entirely." But with the true consequences of the spill yet to be determined, this is perhaps a little premature. What is more clear is that making history seems less of a priority right now than establishing blame. Last week, it was Wall Street "fat cats" who were being roasted by members of Congress. This week, it’s been representatives of BP and Transocean Ltd. But while venting anger and debating when and how to reintroduce a moratorium might make people feel good, what does it actually achieve? "That’s what’s sad about this opportunity," says Lisa Margonelli of the New America Foundation. "We’re going to expend a lot of energy towards these moratoriums when we could be addressing the underlying problem, which is the oil consumption itself." Perhaps, if the worst fears are realised, something will emerge that addresses such fundamental issues. If so, it wouldn’t be the first time a disaster spawned a piece of legislation. "After the Exxon Valdez oil spill of 1989, that helped to create a political environment that was more favourable to restricting pollution and making polluters pay," says Daniel Weiss, director of climate strategy at the liberal Centre for American Progress. One indirect result, Mr Weiss says, was passage of the Clean Air Act Amendments in 1990, even though the act and the spill were completely unrelated. "The same is possible here," he suggests. Of course all of this depends on a disaster which hasn’t quite materialised yet. But it seems clear that the fate of energy legislation, just like the fate of beaches, wildlife and livelihoods along the Gulf Coast, rests to great extent on the wind, the tide and human ingenuity. 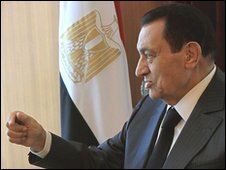 Egypt’s President Hosni Mubarak has challenged opposition groups to spell out their ideas for reform in his first public speech in months. The government of Mr Mubarak, who has ruled since 1981, has used emergency laws to severely restrict political activity and protest. Protests calling for democratic reform have increased recently. Mr Mubarak, 82, has not indicated if he will stand for election next year, but in March returned from surgery abroad. Egyptians are also complaining about high food prices and calling for better pay. Food prices in Egypt are on the rise, pushing meat out of the reach of most people. Speaking in Cairo on his return from Sharm al-Sheikh where he has been convalescing, he warned against stirring up "chaos" in the country. "I say to those who raise slogans and content themselves with posturing: this is not enough to gain the trust of the people," he said. "They must respond to the questions of the poor, what can they offer them? "In this delicate period there can be no room for those who confuse change with chaos," he said. He also promised the elections would be free and fair. Mohammed ElBaradei, the former head of the UN’s nuclear watchdog, recently returned to Egypt from years of living abroad. He has said if the constitution was changed to ensure fair elections he would consider standing for president in an election due next year. He launched a new "forum for change" but has not said he will try to register it as a political party. The main opposition party, the Muslim Brotherhood, is a banned organisation. It does have members of parliament, but they are elected as independents. Muslim Brotherhood leaders are often arrested and their houses searched. Mr Mubarak has just returned from Germany where he underwent surgery to remove his gall bladder. 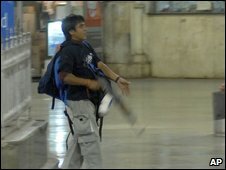 A Pakistani man convicted over the 2008 attacks in Mumbai (Bombay) has been sentenced to death by a court in India. Mohammed Ajmal Amir Qasab – the only gunman who survived the attacks – was found guilty on Monday. He was convicted on charges including murder, waging war on India and possessing explosives. The attacks left 174 people dead, nine of them gunmen, and soured India’s ties with Pakistan. India blamed Pakistan-based militants for the attack. Judge ML Tahaliyani said he had awarded the death penalty because there was no chance Qasab could be rehabilitated. The BBC’s Prachi Pinglay in the courtroom in Mumbai says that Qasab shook his head when he was asked if he wanted to make a statement. He was later seen wiping his face and talking to a policeman. The pro-democracy party of Burmese opposition leader Aung San Suu Kyi is to disband when a registration deadline for elections expires at midnight. The National League for Democracy (NLD) is boycotting the polls because it says the laws under which they will be held are unfair. Burma’s military leaders say any existing party that fails to register must disband. The NLD overwhelmingly won elections in 1990 but was never allowed to govern. The forthcoming polls – for which no date has yet been set – will be Burma’s first in 20 years. International observers have roundly criticised the newly enacted election laws – and critics say the military will use the election to strengthen its grip on power. Senior NLD leader and co-founder Win Tin told the BBC that the mood at NLD headquarters in Rangoon was sad but defiant. "It is a great moment for us, it is a great message to the military that our party is sound and has decided not to register because the laws are really untrue to us and oppressive and subjective," he said. The election laws, announced in March, ban anyone with a criminal conviction from being a member of a political party. That meant that the NLD would have to expel Ms Suu Kyi and other key leaders if it wanted to take part in the polls. The laws also nullified the NLD’s 1990 victory. Under the military-drafted constitution, 25% of seats in parliament are reserved for the military. Several top military officials are also reported to have stepped down to run as civilian candidates, potentially further strengthening military numbers in the chamber. The NLD was founded in 1988, in the wake of the 8/8/88 anti-government violence. Since the party’s 1990 election win, Ms Suu Kyi has spent much of her time in some form of detention. The registration for new political parties begins on Friday and reports suggest that some ex-NLD members could regroup to form a new party that can contest the polls. For Win Tin, a veteran leader of Burma’s main opposition party, 6 May should mark a day of disappointment, to say the least. The party won Burma’s last elections in 1990 but was never allowed to take power. Since then it has worked without success for democracy, many of its top leaders serving long jail sentences for their activism. 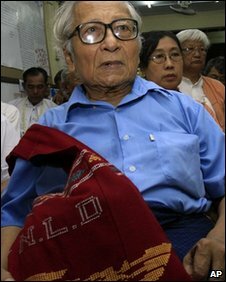 Win Tin, 79, co-founded the NLD and has spent 19 years as a political prisoner in the country’s notorious Insein prison. But he told the BBC he had no regrets about his party’s decision to boycott the elections – even though the NLD will cease to exist. The laws also nullify the NLD’s 1990 poll win. He said the mood at the NLD’s headquarters in Rangoon was sad but defiant. 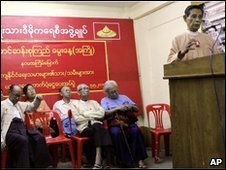 The veteran leader said the NLD’s boycott – along with that of several parties representing Burma’s ethnic groups – would make it clear to the international community that the elections were "not legitimate and not credible". Under Burma’s constitution, 25% of the seats in parliament will be allocated to the military. Any constitutional change would require more than 75% approval, meaning that the military endorsement would be needed. There are also reports that several senior members of Burma’s ruling junta recently resigned their military posts in order to run as civilians, potentially significantly increasing the number of military allies in the chamber. "All over the country we have about 300 offices, so in almost every town we have our offices. We don’t mind working for the people as a group not as a party. "We don’t know about tomorrow but we will be here." A colossal star many times the mass of our own Sun is seen growing in a bubble of gas and dust just pictured by the Herschel space observatory. The image of the bubble, known as RCW 120, has been released a few days ahead of the European telescope’s first birthday in orbit on 14 May. Herschel’s infrared detectors are tuned to see the cold materials that give birth to stars. Pictures like RCW 120 will help explain how really giant ones are made. The monster in this picture is seen as the white blob on the bottom edge of the bubble. The "baby" star is already some eight to 10 times the mass of our Sun but is surrounded by about 200 times as much material. If more of that gas and dust continues to fall in on the star, the object has the potential to become one of the Milky Way Galaxy’s true giants. Present theories of star formation struggle to explain how objects larger than about 10 solar masses can exist. The fierce light they emit should blast away their birth clouds, limiting their growth. And yet, astronomers know of stars that are 150 times the mass of our Sun. The unique capabilities of Herschel – it works in the far-infrared and sub-millimetre range (55 to 672 microns) – mean it can see physical processes that are beyond the vision of other telescopes. Hubble, for example, which senses visible and near-infrared light, is blind to the details in this picture. 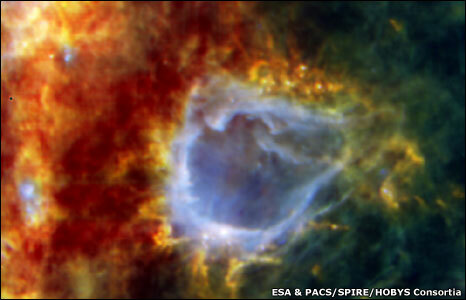 Scientists hope Herschel’s vision can give them the information they need to correct their models. The European Space Agency’s billion-euro observatory was sent into orbit a year ago on an Ariane rocket. It is positioned far from Earth to give it an unobstructed view of deep space.